While a near-term uptick is in the cards for the EUR/GBP, longer-term the prospects remain dim. Although the spotlight has shone largely on Brexit since the summer referendum, fundamental developments alongside policy decisions have returned as the major drivers of EURGBP momentum. Data delivered throughout the month have continued to corroborate the idea that the Euro Area’s lack of cohesive fiscal policy and political integration continue to hamper efforts to restore growth. By comparison, the UK is not hamstrung by politicking thanks to the Conservative Party’s majority in the House of Commons, enabling for a better transmission of fiscal measures designed to boost economic activity. As a result, the steep Pound devaluation has helped the economy begin to flourish once more as inflation climbs and unemployment trends near an 11-year low. With monetary policy only forecast to diverge further over time, the stage is set for the EURGBP uptrend of the last year to begin reversing. Even though the Bank of England has struck a highly accommodative tone after dropping interest rates over the summer, as the subsequent data has shown, the UK economy has not experienced the significant downturn that was preached by the “Bremain” camp. In fact, as the latest inflation data shows, UK consumer prices are rising at the fastest pace since October of 2014, climbing 1.20% during the month of November. Should inflation continue to climb, the Bank of England may be forced to respond by raising interest rates instead of additional accommodation. Even though added easing measures may be viewed as dovish and thus hurting the Pound, the additional £60 billion in easing pales in comparison to the ECB’s asset purchase activities. Comparable economic metrics in the Euro Area have not shown quite the tenacity of their UK peer as evidenced by unemployment which remains double the UK rate as the European Central Bank struggles to raise inflation further. Although the supportive monetary policy conditions are set to remain into the distant future following the latest decision from the Central Bank, the real test of the Euro Area will fall squarely on the backs of politicians. Without structural reform and fiscal stimulus, the Central Bank will be forced to carry water for sovereign governments, putting even more strain on the tenuous Euro Area recovery over the medium-term and hurting the prospects for a longer-term improvement. The ECB’s plan to extend purchases past the initial March expiration is likely to keep a lid on any Euro appreciation through the end of 2017. However, the factor that could readily disrupt that reality is the evolution of Brexit negotiations. Right now a “hard Brexit” has been largely priced-in to expectations, especially as the UK government works to clear hurdles put in place by the High Court of Justice. However, the process remains in a state of suspense, presenting a risk to the Pound that could very well shatter the prospects of any sustainable, long-term recovery in the UK currency. Acting on fundamentals alone without the uncertainty of Brexit places most of the risks to the EURGBP outlook to the downside, with Brexit serving as the potential black swan event that disrupts the outlook. Looking at the most recent price-momentum of EURGBP, it is apparent that the pair remains under significant pressure, especially following the ECB’s decision to extend asset purchases indefinitely. 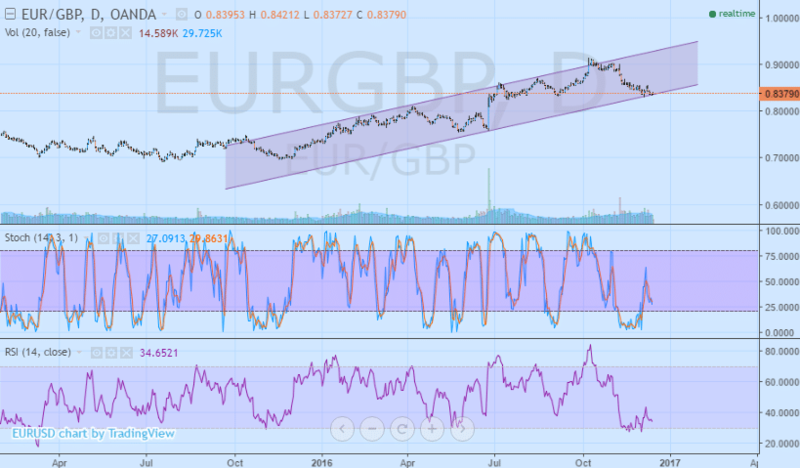 However, EURGBP is currently sitting on top of a major support level at 0.8390. The level coincides with the 200-day moving average which is currently trending higher below the price-action and also acting as support. Keeping a lid on any upside is the 50-day moving average trending downward above the price action. 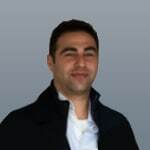 At present, the more medium-term moving average corresponds with resistance at 0.8685. 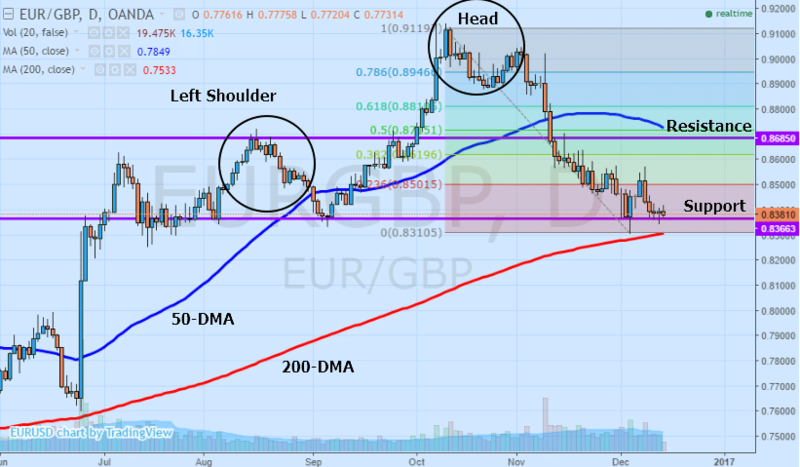 Based on the trajectory of the moving averages and strength of the 200-DMA, it is likely that EURGBP experiences a modest bounce over the coming sessions, especially as momentum indicators rebound from oversold territory. Both the Relative Strength Index and Stochastic Oscillator have rallied from below thresholds typically viewed as oversold. Should they cross back above their respective 50.0 thresholds and make new highs compared to heights reached earlier in the month, it could suggest sustained momentum higher, paving the way for EURGBP to retest resistance. Besides the tug of war between moving averages and momentum indicators, a potential head-and-shoulders bearish pattern has emerged. After the latest selloff from October highs, the right shoulder may be in the process of forming. However, if resistance at 0.8685 is overcome, it could suggest the continuation of the prevailing bull trend in the pair, especially if the 61.80% Fibonacci level at 0.8810 is surpassed. Nevertheless, if resistance holds up against a rally, it could be suggestive of a strong opportunity to initiate bearish positions targeting support and a downside breakout. While it is very feasible to see a near-term uptick in the EURGBP thanks to a recent selloff that deserves a technical correction higher, longer-term the prospects for a sustained uptrend in the pair remain dim. Between broad improvements in UK fundamentals alongside cohesiveness between fiscal and monetary policy, the UK economy is set to outperform the Euro Area over the medium-term. While Brexit does remain the major tail risk facing EURGBP, after a brief respite, expect the downward momentum in the pair to resume as the distance in key fundamental metrics remains wide.